This fun fall recipe has been one of my most popular posts, so I’m sharing it with you again! This recipe comes from Food Family Finds. 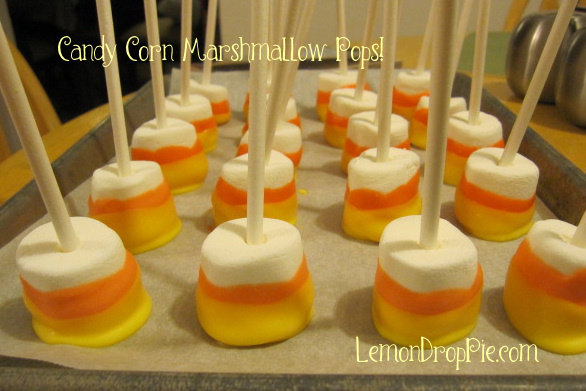 These easy Candy Corn Marshmallow Pops were a huge hit with my daughters and their friends last Halloween. Melt the orange candy melts and a tablespoon of Crisco for each 1/2 cup of candy melts in the microwave using the directions on the package. 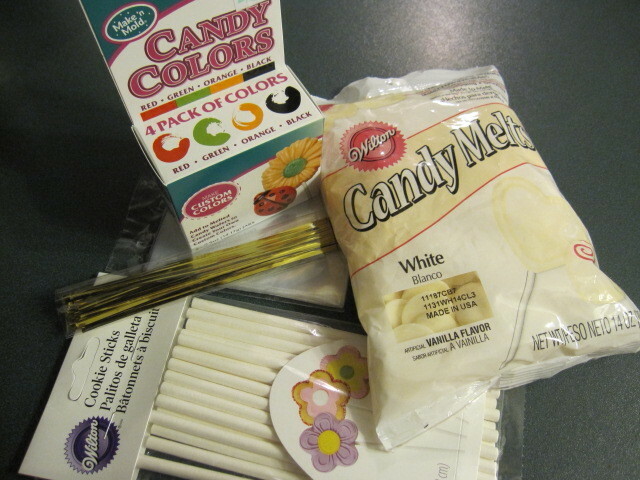 If you are using white candy melts, be sure to use candy coloring only, not food coloring. Food coloring will make your candy too runny and it will not set properly. Dip the marshmallows two-thirds deep into the candy. Place the marshmallows on a cookie sheet lined with parchment paper. When the orange candy is completely hardened, repeat the process with the yellow candy melts, dipping the bottom one-third of the marshmallow into the candy. Allow the candy to harden completely. 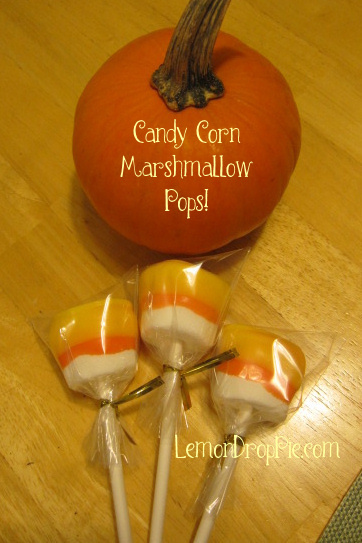 Candy Corn Marshmallow Pops are a fun treat to bring to a Halloween party. They are also a great gift for teachers, babysitters, or any one who has a sweet tooth! Over at the SITS Girls, we are Falling back into blogging! Today we are sharing a fall recipe or craft. What are you making this fall? Find me on Pinterest! oh what a cute Candy corn. They looks so yumm and festive, need to look for a substitute for couple of igridients that is not findable here in the Netherlands. Wow! These are super cute and fun. They look great for Halloween. I really want to make them with my kids! Thanks for such a great idea. That looks so yummy and easy to make. I would love to do that, but I haven't got a clue what candy melts are and whether I could get them in the Netherlands. And Crisco is another of those I have never heard of. I will have to look into it! Now that's a candy corn I could eat. They are so cute. Love this idea!! My kids will love to make these (and eat them, of course!!) 🙂 Thanks for sharing!! Happy Fall!! These look soo great! Thank you for sharing!! I WILL make them! Pinning them! My recent post First Thanksgiving Menu – Let's begin! Thanks for pinning them, Paloma! Thanks for stopping by, Stacey! What a great idea! I'm definitely gonna try this for my daughter's kindergarten class party. Where do you get the candy melts form? Love it! My recent post Pumpkin Seeds: Taste Good and Good For You. Hi, Hope! You can find candy melts in the candy making aisle at Walmart or a craft store like Michaels and Hobby Lobby. If you are making them for school, just be careful about allergies and read the labels. My bag of candy melts says that there might be traces of peanuts in them since they are made in a factory that also produces peanut products. Thank you, Amanda! I'm glad you stopped by!